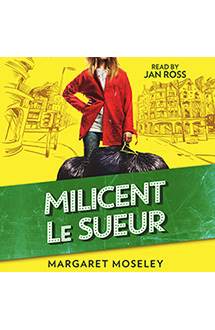 Millicent Le Sueur is an eccentric, obsessive-compulsive bag lady in a rural Southern town who witnesses the hit-and-run killing of a teenage girl. Or so she claims. Some townsfolk believe she killed the girl and made up the story to cover her crime. Battling her neuroses and psychoses, and counting her steps along the way, she tracks a killer she hopes won’t count her as the next victim. There are four Stevens in free-spirited, 28-year-old Honey Huckleberry's life, the three she knows and the one she doesn't...a stranger who calls her with a cryptic message about an imminent murder. Margaret Moseley's Edgar Award finalist captures Fannie Flagg's homespun charm and Janet Evanovich's laugh out loud humor in an refreshingly original story with an unforgettable heroine.